Marco Estrada deserved a better fate than what he got on Thursday. Estrada pitched six innings of one run ball giving the Blue Jays every chance to stay in the game. It went for naught as the Jays stranded the tying run on third in the sixth and seventh innings before Liam Hendricks came in and had his worst outing of the year with some help from Jose Bautista who over ran a ground ball and resulting in a 3 base error which at the time turned a 1-0 deficit into a 4-0 hole that proved too much for the Blue Jays to climb back from. The Blue Jays did get on the board in the eighth as Edwin Encarnacion doubled home Jose Bautista for the lone Jays run and ran his hitting streak to 22 games. The Jays were an out away from bringing the tying run to the plate in the ninth, but Rangers Closer Shawn Tolleson was able to get Troy Tulowitzki to line out to short with Ryan Goins at third base to end the game. If some one had told me at the beginning of this road trip that the Jays would win 6 of 8, with six of those games against teams in the second wildcard spot I would have gladly signed up for it. So despite today’s setback the road trip was a successful one considering how the Jays usually fare on these Western road swings. With the road trip out of the way, the Blue Jays will open up a nine game homestand Friday night against the Tigers who will send former Blue Jay Matt Boyd to the mound while the Blue Jays will counter with R.A Dickey. Drew Hutchison will make his return to the Blue Jays rotation on Saturday, and Mark Buehrle goes Sunday afternoon. The Tigers starters for the weekend will be Buck Farmer on Saturday and Alfredo Simon on Sunday. To be totally honest I really like the match-ups for the Blue Jays in this series. As for the rest of the homestand the Jays will host Cleveland starting Monday night and then after an off-day on Thursday the Orioles come into town for Labour Day weekend. Lastly if you’re into the magic numbers in the pennant races, The Blue Jays who are up a game and half on the Yankees for top spot in the East now have a Magic Number of 35 for the Division, and for a playoff spot the Magic Number stands at 30. The Blue Jays are six games clear of both Minnesota and the Los Angeles Angels who both sit at a half game back of the second wild card spot which is held by Texas. 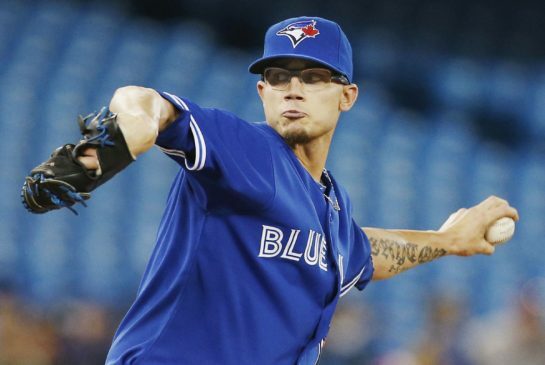 The Blue Jays avoided arbitration with pitcher Brett Cecil on Thursday signing the left-hander to a one-year 2.475 million deal. The Blue Jays still have four players that are arbitration eligible, Danny Valencia, Marco Estrada, Josh Donaldson and Micheal Saunders. The deadline for arbitration is noon on Friday, and even if the Jays don’t reach agreements with all four by tomorrow’s deadline they could still reach agreements ahead of the arbitration hearings February 2nd to the 20th. The last time the Blue Jays actually went to an arbitration hearing with a player was in 1997 with Bill Risley. The Blue Jays also signed Outfielder Andy Dirks to a minor league deal with an invite to Spring Training. Dirks was claimed off waivers early in the off-season but was non-tendered in December. Dirks could be in the mix for the fourth outfield spot with Kevin Pillar looking for a spot on the Opening Day roster as well. In three seasons in Detroit Dirks batted .276 with a .332 OBP and a .413 slugging percentage. With new turf going in before the start of the season, The Blue Jays and the Rogers Centre used this past weekend’s coaches clinic as the final farewell for the old turf. Having taken part in the past two clinics on the turf it doesn’t take long before it feels like your walking on cement. Here’s hoping the new turf is a heck of a lot softer than the old turf was and hopefully won’t look as atrocious as the old turf did. Buster Olney had some interesting tweets today about the Blue Jays’ pursuit of Baltimore GM Dan Duquette. Re: Dan Duquette/Blue Jays: Ball is in the hands of TOR ownership, which knows it will take an extraordinary offer to get him from O's. Ed Rogers is the point person in the Blue Jays' pursuit of Dan Duquette, not surprisingly. This ends one of three ways: 1. Duquette declares he wants to stay w/O's, which hasn't happened. 2. TOR turns elsewhere for good. 3. A deal. Interesting that the point man on the Blue Jays end is Ed Rogers who has an ownership stake but since Guy Laurence took over as CEO hasn’t had a role on the Rogers board, which makes me wonder just how much clout he has within Rogers. To have gotten to this point it would seem to me that Ed Rogers has a helluva lot of clout. The biggest thing that scares me is the compensation that Orioles owner Peter Angelos is asking for is too rich for a guy who has never actually been a president of a baseball team before. Ken Rosenthal was on Prime Time Sports on Thursday night and said at this point it would seem that it’s 100 percent that Duquette ends up as President of the Blue Jays. It should also be said that Rogers has really dropped the ball in this whole ordeal, to let Paul Beeston twist in the wind the way they have is just flat out wrong. For all that Beeston has done for the Blue Jays he deserves better than what he’s gotten since the end of the season.